I’m still plagued with an over-abundance of tomatoes, so despite the fact that it felt like fall today, my chef’s knife is still slicing and dicing summer produce. I love that the veggies in this casserole didn’t lose any of their fresh taste in the cooking process; it is a definite”make-again” recipe! Chop, fry, and drain six slices of bacon, reserving two tablespoons of grease. Pour all into greased 9 x 13 pan. Top with more chopped tomatoes and cheddar. Bake at 375* for twenty-ish minutes. Past the bacon, I feel pretty decent about the health quotient of this supper, and I’m never mad about my kitchen smelling like bacon. Additionally, I was thrilled to use so many of my fresh tomatoes; the garden will be bedded with snow before I know it! 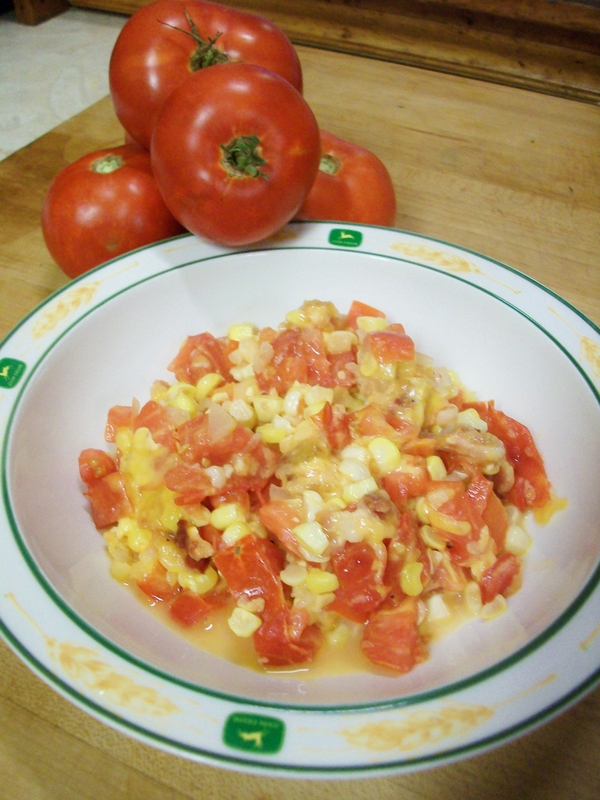 Posted in Junk DrawerTagged bacon, casserole, cheddar cheese, Cook, corn, fresh, summer produce, tomatoBookmark the permalink.